William Nott, by E. Davis . Edward Davis was mainly a portrait sculptor, exhibiting nearly a hundred works of portraiture at the Royal Academy over more than 40 years. He was born in Carmarthen, Pembrokeshire, in South Wales, studied in London at the Royal Academy Schools in 1833, and also in the studio of E. H. Baily. He exhibited at the Academy from 1834, through almost to the end of his life, his last exhibit being in 1877. His portraits included a variety of artists as well as statesmen and religious figures, and we may note portraits of various members of the society painter James Sant’s family, and busts of Daniel Maclise and John Constable for the Royal Academy. Alongside his portrait works, he exhibited some few works in relief showing religious subjects, and a lesser number of classical works, including an Andromeda , Venus and Cupid at the 1851 Exhibition, and a Cupid and Psyche as late as 1875. 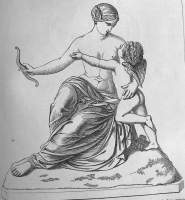 He also made two seated allegorical figures for the 1840 frontage of the Adelphi Theatre, which can be seen in a woodcut in Wikipedia. 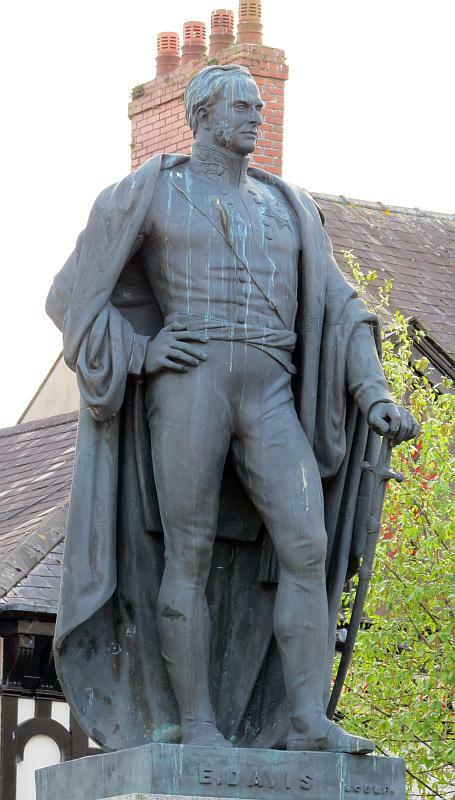 In Leicester is his bronze statue of John Henry, Duke of Rutland , showing a rather stooped man, with a patrician sneer which rather detracts from the work. Although he was based in London for most of his life (in and around Fitzroy Square), back in his Pembrokeshire birthplace, appropriately enough, may be found a statue of General William Nott . This is perhaps his best full statue, showing the subject as a rather heroic figure, with stern expression and athletic pose. We may also mention his statue of Wedgwood , in Stoke on Trent, depicting him holding his replica of the Portland Vase, but the expression on this dandified figure is rather blank and the work contrasts unfavourably with, for example, the figure of Wedgwood on the front of the V&A. The Venus and Cupid is now in the collection of the Salford Art Gallery. A bust of William Rathbone is among the collection in St George’s Hall, Liverpool. He has one work in Westminster Abbey, a bust of Newell Connop Thirlwall , one time Bishop of St David’s Cathedral in Wales.